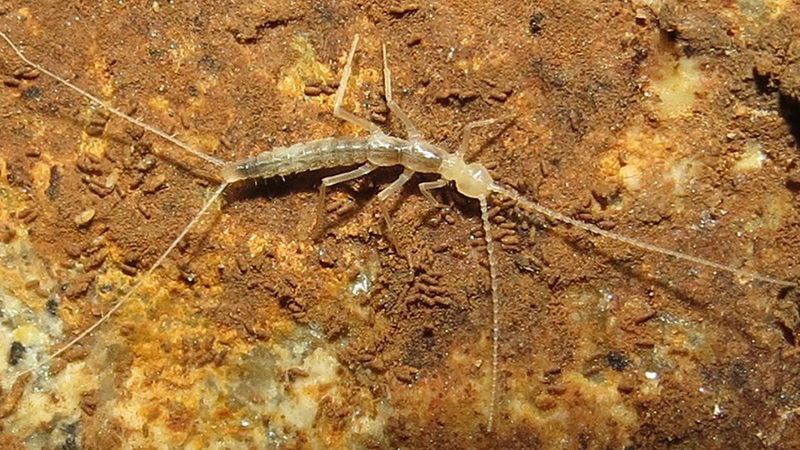 The giant newly described species Pacificampa daidarabotchi, discovered in the Mejiro-do cave, Kyushu, Japan. Photo by Rodrigo Lopes Ferreira. Amongst the fauna thriving in the subterranean spaces below the surface of the earth’s crust, the insect-like diplurans and, precisely, those in the campodeid family are one of the best-known groups, currently comprising almost 150 species. However, not a single subterranean member of the family had been known from Japan until very recently. The Mejiro-do cave, Kyushu Island, Japan: the type locality of the newly discovered record-breaking species Pacificampa daidarabotchi. Photo by Rodrigo Lopes Ferreira. “We hope that this discovery could stop the destruction of the land nearby and preserve for the future the subterranean habitat of these remarkable gigantic species,” say the researchers in conclusion. Last year, lead author Dr. Alberto Sendra and his colleagues Prof. Boris Sket, University of Ljubljana, and Prof. Pavel Stoev, National Museum of Natural History, Bulgaria, described another cave-dwelling campodeid dipluran to the world’s amazement. Discovered in Eastern Turkmenistan, the species, whose name (Turkmenocampa mirabilis) refers to its wondrous peculiarity, was the first of in the order Diplura found in Central Asia. Further, it was the first strictly subterranean terrestrial creature recorded in the country.